Wharton Resource Guide. Enhance satisfaction. Improve productivity. 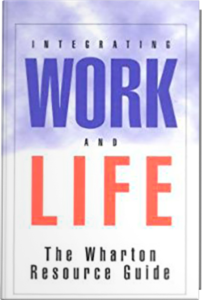 Over 20 years ago, Stew Friedman, Jessica DeGroot, and Perry Christensen organized a series of conferences that brought together many of the seminal thought leaders in the emerging field of work and life. Their goals were to identify what it takes to successfully integrate work and rest of life and to gather teaching and training materials to help people learn those principles and skills.